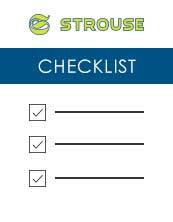 Who We Work With | Strouse | More Than Tape. Where can the designers at Ford get innovative adhesive solutions that help them model next year's Mustang? Who do the engineers at GE rely on for cutting-edge adhesive solutions that bring the advancements in science and technology into our everyday lives? How do those at US Army, who everyday focus on precision and accuracy, trust adhesives for mission critical applications? What do the designers at Tesla do when they are faced with nearly unsolvable problems in the mechanism of their electric battery? When the folks at IBM are stumped trying to build a smarter planet, where do they turn? They choose Strouse. Get your adhesive die cuts where engineers and innovators get theirs. Fortune 500 companies rely on Strouse to solve difficult applications using adhesives. Our solutions help businesses save time and money, or bring products to market faster. Partnerships with world class suppliers like 3M bring our customer's solutions to life. Strouse can rotary die cut pressure sensitive adhesive to custom sizes, shapes, and formats. We can provide you products in the form of custom width rolls of tape or custom cut parts on a roll, on a sheet of material, or as individual pieces.